So I’ve finished reading Holland’s book on the origins of Islam and I have to say I am not very impressed. I’ve revised my goals a bit and I will no longer be doing a point-by-point refutation of his book since much (as Holland himself admits) is speculatory, far too broad to refute directly and simply does not require much work to see why he is wrong in his main ideas. The origins of Islamic law and its development is also covered in the book (though rather amateurishly), but that will be discussed in a separate post as it is far too big and too important not to have a post on its own. One of the main arguments in Holland’s book which I would like to refute is his ideas on the ‘original’ location of Mecca. Holland believes that the current Mecca, located near Yathrib, South arabia, is not the original place of its existence. It was actually in Palestine, and subsequently there was a great conspiracy by the Ummayyads to move the location and hide all the proof of its previous place of standing. ‘Am al-Fil: The year in which the Yemenite Christian king Abraha is said to have tried to attack Mecca to destroy the Ka’ba, in an attempt to divert pilgrimage from the Meccan shrine to his own great cathedral in Yemen. The name, meaning “Year of the Elephant”, refers to Abraha’s usage of war elephants in his army which he led towards the Quraysh at Mecca. 1 Do you not see how your Lord dealt with the army of the elephant? 2 Did He not utterly confound their plans? 3 He sent ranks of birds against them, 4 pelting them with pellets of hard-baked clay: 5 He made them [like] cropped stubble. 1 [He did this] to make the Quraysh feel secure, 2 secure in their winter and summer journeys. 3 So let them worship the Lord of this House: 4 who provides them with food to ward off hunger, safety to ward off fear. The story alluded to here is undoubtedly the events in the Year of the Elephant. Commentators are absolutely unanimous in this regard. One may still doubt whether these Qur’anic passages really do allude to ‘Abraha’s march towards Mecca. However, there is non-Qur’anic pre-islamic poetry that reports the same story that Muslim exegetes provide in their explanation of these verses. For example, in the kitaab al-hayawaan by al-Jahiz, a poem by Abu Qays Sayfi praises God for His help on “the day of the elephant of the Abyssinians”, recalling that the elephant simply stopped dead in his tracks and would not advance despite being tortured. Then “God sent a wind bringing a shower of pebbles (ḥāṣib) from above”. Rubin notes that the vocabulary of the poem is distinctly unqur’anic. Infact, the poem has different themes to that of the Qur’anic account: The Qur’an, as with recounting other pre-islamic occurrences, spins it into a cautionary tale and rhetorical prose to convince the audience of the magnificence of God. To scholars, this indicates that Abu Qays’ poetry is independent from the Qur’an. It is very likely that the poem is pre-islamic. It is important to note that the same poet also identifies this incident with “Abu Yaksum” – none other than Abraha himself. This is significant- there is already enough similarity between the pre-islamic poem and Surah al-fil to realize that they are talking about the same event (due to an elephant being involved and an army being wiped out by stones from the sky). Thus, it obviously follows that both versions of the story (Qur’anic and pre-islamic) are speaking about an attack on the Quraysh by the Yemenite king Abraha. What I would like to drive home at this point is that now we have Arabic poetry originating decades after the death of Abraha, authored by and for the Arabs which were contemporary with the incident, if not from the following generation. The Quranic account is independent from the poem, providing an added level of attestation to the historical account; again, written for Arabs that would have probably been children of those who lived even as Abraha led a campaign against Mecca. The story is both early and multiply attested. If we ignore the miracle story, there is little reason for a historian to deny that the expedition occurred*. The inscriptions are significant because Abraha’s army would be the only one in the area to parade war elephants. 1. The Qur’an is reporting a pre-Islamic event that must have actually happened some time during Abraha’s reign, meaning that the generation before the Prophet’s own. 2. Abraha campaigned with war elephants in the South Arabian region. After establishing these two points, it is now possible to see how Holland’s assertions do not coincide with the historical facts presented here. Holland places the ‘original’ location of Mecca in Mamre, Palestine. Palestine in the 6th century was situated in Byzantine land. The corollary? That Abraha must have attacked the Byzantine empire some time in the 6th century. One only needs to be slightly familiar with 6th century byzantine and arabian history to know how this is plain and simply false. 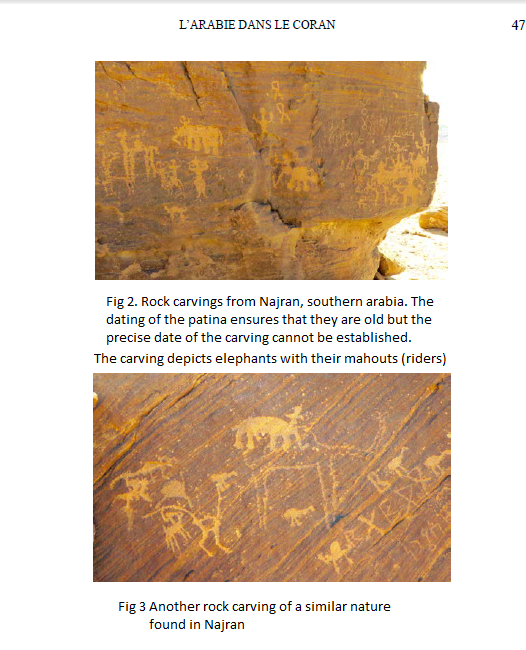 We can understand why the expedition of the elephant is absent from pre-islamic jahili written tradition (plainly due to the fact that the writing was comparatively rare in the first place), however an attack on the Palestine would have been recorded at least by Roman sources. Procopius, a byzantine historian living in Palestine during the reign of Abraha records his ascent to power over the Himyarites, as well some of his wars and political exploits during his reign. Abraha’s supposed attack on Palestine goes unmentioned, however, his promise to Justinian to attack the Persians does not. I believe in this case we can make a good argument from silence. Had the attack happened, Procopius would have written about it, if not some other roman historian. Besides Procopius’s account, Abraha campaigning against the Byzantines simply seems unlikely. The latter is was a regional superpower sharing the same religion as that of Abraha, so unlike Islam’s conquest of Roman lands, there is no theological motive to challenge a natural alliance. This explains why Abraha aligned himself with the Byzantines against the Persians at one point. On the other hand, an attack on a south arabian Mecca simply seems much more plausible. Inscriptions indicating Abraha’s political and military might over this area are well known, some of which have been reproduced in this article. There is also the Murayghan inscription, reporting of an expedition sent by Abraha towards Taraban, 100km north of Ta’if, which is in the vicinity of the traditional location of Mecca. Tom Holland’s proposal that Mecca was originally located at Mamre, Palestine cannot be correct because it contradicts known facts surrounding the expedition of the elephant. As there is good evidence for the expedition, it would entail that the Himyarite king marched against the Byzantines, which contradicts what we see in Roman historical records and also goes against common sense. The next post in this series will insha’allah expose some of the dubious methods with which Holland draws his conclusions. I actually do believe that this next post will provide a stronger argument, as it draws from common objections (and not those of an amateur blogger, ie. me) against Crone’s (and therefore Holland’s) theories on early Islam. I did want to do something “different” though, and as far as I am aware the argument presented in this blog post is a novel one. For an overview of the traditional story, see “The Message of the Qur’an”. Muhammad Asad. See intro to Surah al Fil. Other reasons are proposed for the motives of the campaign, one of which is that some Arabs went and defiled the cathedral in Yemen which incited ‘Abraha’s anger. See entry for Abraha. Rubin, Uri. Encyclopaedia of Islam, 3rd ed. ibid. It must be noted that the name is not Qur’anic, meaning that the poet must have had non-Qur’anic sources. This adds to the likelyhood of the poem being of Jahili origin. * Scholars such as Rubin, Conrad and Robin have all argued for or have assumed the historicity of the campaign. Les Compagnons de l’Éléphant (Aṣḥāb al-Fīl ). Christian Robin. Published in Les origines du Coran, le Coran des origines. 2015. p47. I have roughly translated from french and edited in the captions. That of Abd Al-Muttalib- indeed, he is present in the traditional story of the expedition. This is why I was stressing the pre-islamic poem that I mentioned. It has common elements with the surah, which leads us to believe that they are speaking about the same event. Now, the pre-islamic poem also specifies who it was that was involved in the attack- “Abu Yaksum”. The scholars that I am quoting from all believe that this event has a historical core to it. It’s actually not at all that unthinkable. It’s very much possible. Agreed; one may disagree with Holland on this (I’m sure there are good reasons) but this blog post presents an alternative that is highly improbable. Qays documenting an event might actually be the source for Mohammed writing it into the Q. “The Quranic account is independent from the poem, providing an added level of attestation to the historical account” Pure nonsense. The Q is primarily literature; and the Surah is in interrogative form with supernatural stuff mixed in. There is a difference between history and literature. Are there any other accounts in the hadith that would count as historical proof of the event? Given that many companions lived during the time of Abraha’s attack. there are some pre-Islamic inscriptions in Medina and Mecca recently discovered, written in Thamudic C and D. But it is not Arabic! They seem to be Semitic dialects, maybe with a pre-Semitic substrate. As you can see, al-Jallad is top tier scholar worthy to follow, too!